- Load PMT and Multistream fields from KingOfSat. - Improve handling of satellite Multistream. - Improve simultaneous transfers to multiple boxes. - Improve browsing, opening and saving files. - Several feature and performance improvements. - Revamped fresh look and feel. - Modern and flexible Ribbon for better user experience. - Deliver overall high performance and speed. - Manage unlimited IPTV accounts (Xtream Codes and M3U). - Support IPTV Live, Movies and Series categories. - Create, edit and sort M3U playlists (groups and channels). - Assign custom EPG provider to the M3U channels. - Export IPTV channels and Enigma bouquets to M3U playlist. - Configure and schedule IPTV updates in the background. - Add new IPTV channels to a predefined group/bouquet. - Select multiple boxes to sync with IPTV channel updates. - Support more M3U directives and formats. 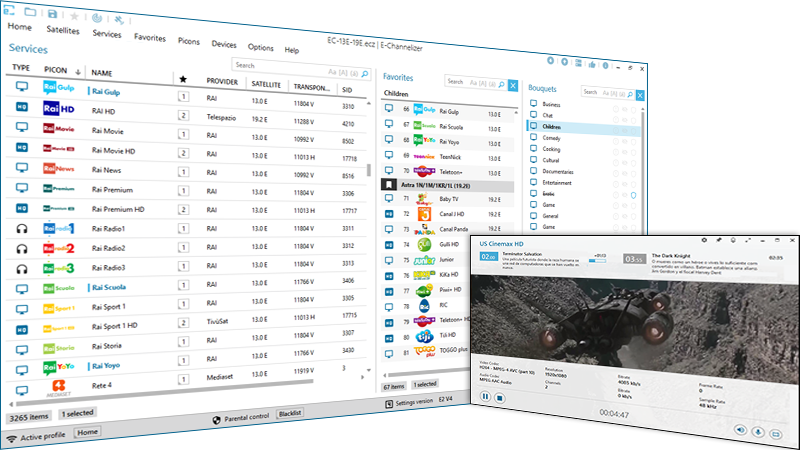 - Improve handling and assigning EPG. - Support the latest changes of ImportEPG plugin. - Group Enigma bouquets into TV and Radio. - Display stream EPG and URL in the favourites list. - Improve channels searching, sorting, dragging and dropping. - Improve handling of Enigma satellite and cable channels. - Support all compressed file formats (ZIP, RAR, TAR, 7Z). - Improve loading and transferring files. - Brand new folders and files browser. - Add the Norwegian translation (thanks to Seagen). - Update the French translation (thanks to StarOS). - Update the Lithuanian translation (thanks to Vytenis P.). Tüm Zamanlar GMT +2 Olarak Ayarlanmış. Şuanki Zaman: 00:33.